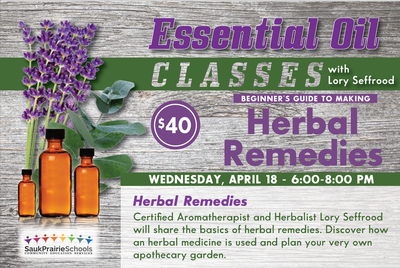 Certified Aromatherapist and Herbalist, Lory Seffrood will share the basics of herbal teas, syrups, oils, salves, tinctures, baths, poultices, and compresses. What they are and how do you best maximize their power? We will define what qualifies as a medicinal herb, discover how is an herbal medicine used, where do you find them? I will share a few of my favorite herb suppliers for either the medicinal herb to use or the herb seed to grow. We will talk about planning your own apothecary garden.